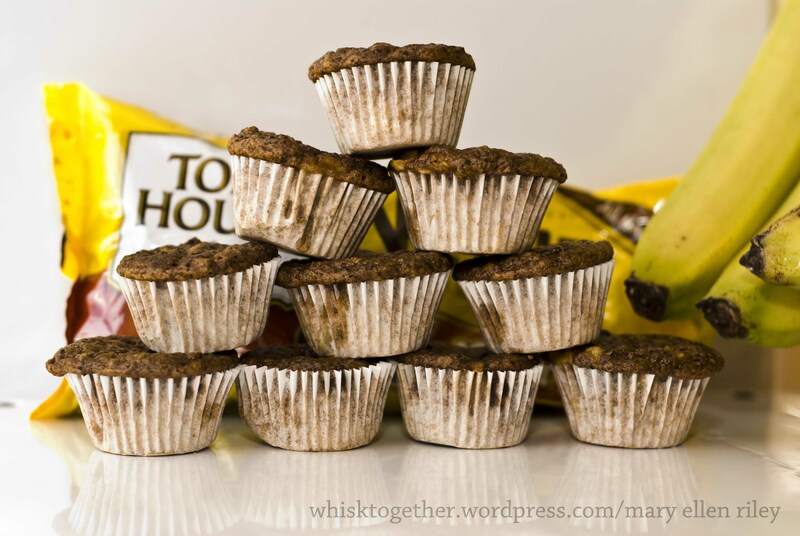 Well, the title is my take on chunky monkey muffins. I don’t think these could make you very chunky! There isn’t much to them. My neighbor and friend made them for the kids one day and Maddox shoved like 4 in his mouth while going out the door – after he’d already had his snack. Soooo… I paid her off to give me the recipe. No, Hilary’s nice and just gave it to me plus she’s a super awesome lady. I don’t recommend cupcake/muffin liners on muffins. They don’t let the muffin rise and give it that nice dome top sometimes. I wasn’t 100% sure they would come out of my metal pan and had liners to get rid of, so I tried liners again and it wasn’t as good as when I don’t use them. I love my Williams-Sonoma muffin pan. Easy to clean, aluminum and always bakes evenly. I have used silicone before and for kids muffins I think it would work well, too. My silicone pans would smell sometimes, but I didn’t taste it in the food. 1. Preheat oven to 350 degrees. Grease muffin tin. 2. In a measuring cup, add the juice and then fill the milk to the 1/4 cup mark. Let sit so the acid can do its thing. 3. In a big bowl, do the muffin method! Mix dry: flour, cocoa, baking powder, baking soda, and chips. 4. In a medium bowl, beat with a kitchenaid or hand mixer: bananas, sugar, egg and vanilla. 5. Add wet to dry and just barely combine. 6. Divide the batter between wells. I use 3 Tbs. cookie scoop for regular size muffins and 1 Tb. cookie scoop for mini muffins. 7. Bake minis for 8-12 minutes. Bake regular ones for 10-15 minutes. Bake large ones for 17-20 minutes. Just use the toothpick and see if it comes out clean.